I’d been teasing you with pictures of the IT Cosmetics CC Cream for quite a while now, and when I identified it as one of my ‘ang pow saver’ picks, someone actually said “A CC Cream? That’s a surprise coming from you!” And you know what? She was absolutely right! Anyone who’s read my blog long enough would feel the same way as this reader did. I used to be quite outspoken against BB and CC creams, the alphabet creams, I called them. To be fair, the ones I started out using sucked for me. I never liked them (they were Korean hence my prejudice against Korean base makeup despite their improvements since) and they were just so bloody gimmicky, claiming to be moisturiser, sunscreen, primer, foundation and everything else you could think of. Bleh. 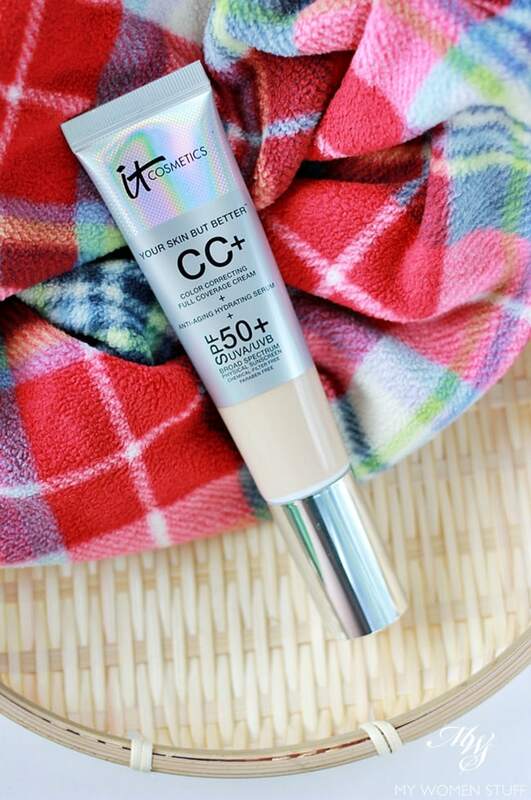 The IT Cosmetics CC Cream promises to do a lot of things – colour correct, give full coverage, have anti-aging and hydrating skincare properties, contain SPF50+ UVA/UVB broad spectrum physical sunscreen, chemical-filter free and paraben free. That’s just what they say on the tube! But I bought this, and treat this, as I would any base makeup product. While I appreciate that it has high sun protection and physical UV blockers, and that it may have skincare properties, it’s still just makeup for me so I really pay those benefits no mind. If all that matters to you, then that’s great. I personally depend on my skincare to deliver all those benefits and a good sunscreen to offer my protection. Anything else is a bonus but is secondary. The product comes in a tube with a pump that is quite easy to control. I use about 1 pump of product, which I find to be less than 1 pump from a normal bottle. However, if you prefer to use less, the pump is quite easy to control. There are 5 shades available, and I picked Fair without seeing what they were. However, Fair is the perfect shade for me. I went into Sephora to take a look at the shades available, and did notice that the next shade up, Light, is a rather significant jump in tone. However, Light has a warmer base, while Fair has a more neutral base with a hint of pink. The biggest problem I feel, would be to find the proper shade to suit your skin tone. 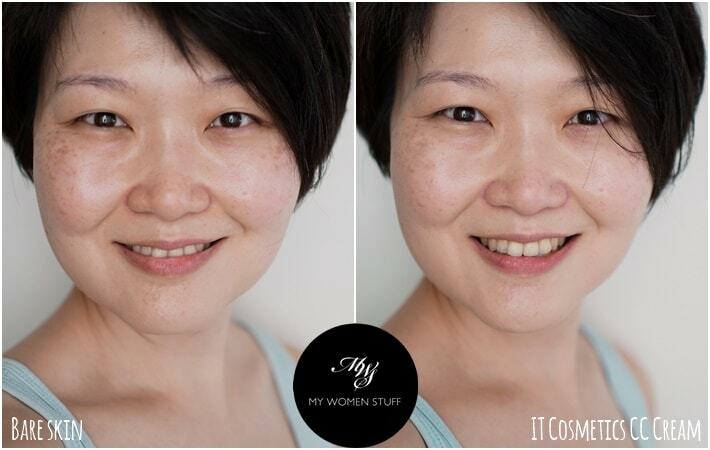 The texture of the IT Cosmetics CC Cream is quite creamy and moisturising and it actually feels very comfortable on my skin. I do however, have slightly drier skin, so I’m not sure how this fares on oilier skin types. If you have oilier skin and use this, do chip in with your thoughts! Coverage is touted as full coverage, which I’d tend to agree, if you use a little more of it. With 1 pump, I find that it offers me medium coverage at best. If I like, I can layer it on where I want more of it. But I usually leave that job to concealer. In this swatch, you may see what I mean about the coverage. Once blended out, it pretty much adjusts itself to my skintone, although you may see a slightly lighter band of colour where the word “blended” is. In that sense, I’d not peg this as full coverage, although it can be layered quite easily and comfortably. Here’s how it looks when I wear it. There isn’t very much difference in the before and after photos is there? Coverage isn’t high enough to cover up dark spots, but it is enough to even out the complexion and to make it look a touch better and brighter. As it says on the tube, it is my skin, but better. For me therefore, I find this natural, but only because I don’t aim for full coverage. What I usually do is use this CC Cream to even out my complexion, then use concealer where I need it, before dusting some powder all over to set. I do find I have to set, to take away some of the shine. This light layering technique gives me a very natural and more flawless visage, as opposed to piling on the base makeup. So, I like this IT Cosmetics CC Cream and I especially like travelling with it because the tube packaging makes it very portable and convenient. The coverage is good, and you can easily build it up, and it’s comfortable. It is also quite expensive, everything considered, but I read they may have smaller tubes that are more affordable. If so, get one of those. I took a picture of the ingredients list, but it’s spread out all over the box so here’s the text version instead. 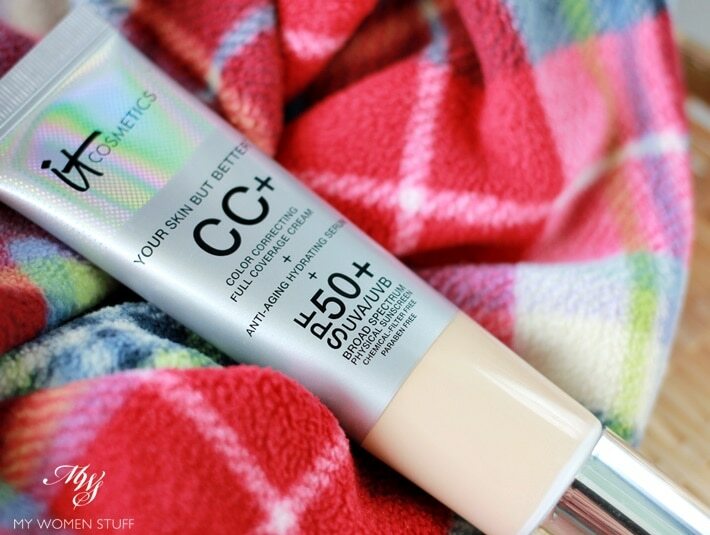 Have you tried the IT Cosmetics CC Cream? Do you use any other CC creams? 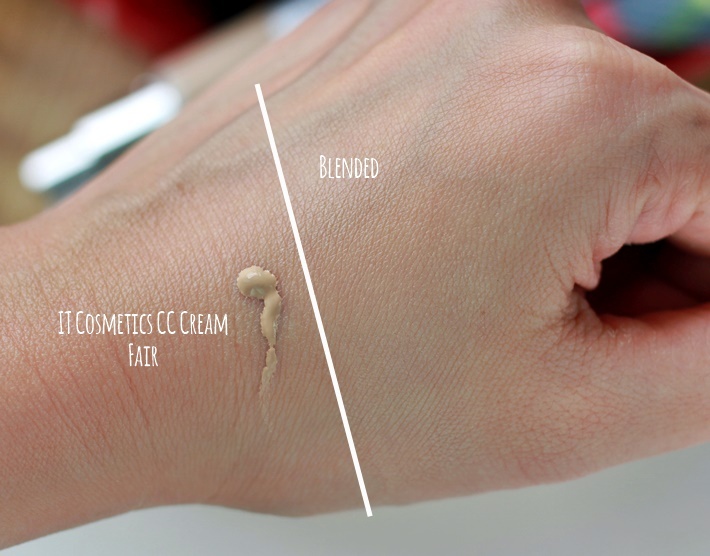 The only other CC Cream that’s impressed me is the one from Bourjois. So, if you are on a budget, consider that one instead. This one, albeit a good product, is pretty pricey. 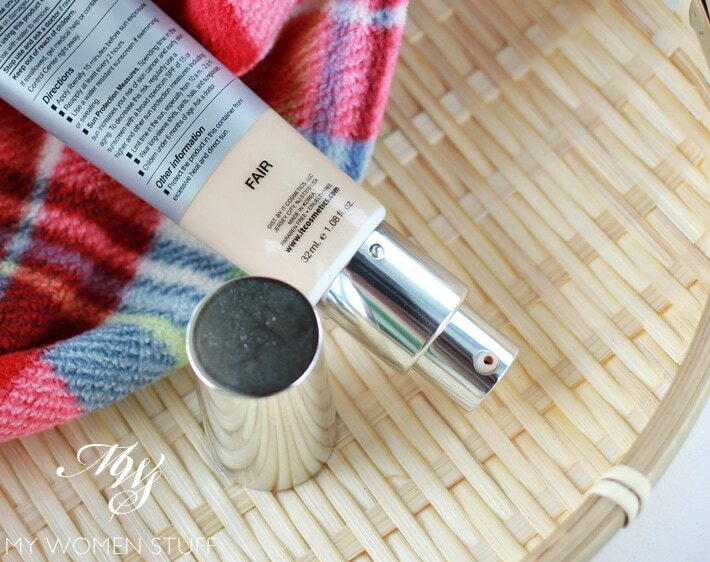 PREVIOUS POST: Your Say: What was the last foundation you finished and would you repurchase? have you ever tried the Chanel CC cream? Also SPF 50 and costs much more. I’ve used my 2nd tube already and it’s finishing and seeing your review for this one, at a much lower cost, I wonder if it’s just as good. the Chanel CC cream is marvelous in its coverage and i love it so much as i don’t need to wear a foundation on top. if this is the same with IT, i wouldn’t mind trying because getting it from Sephora is so much more convenient for me. I tried a sample that a friend gave me. From what I remember, I quite liked it. The coverage was high, and when they got in No. 10 which is my shade, it was a good match. I kept meaning to buy but never did, I think because of the scent. It’s very scented and I just didn’t like that scent. From memory, the Chanel one seems to go on with higher coverage almost immediately. This one, you may have to build it up. But I think in terms of SPF and product, this one maybe better. I think I read somewhere that there’s a sample/mini sized tube sold in Sephora (where all the mini travel sized tubes are) so if you see it there, try it and see if you like it. I think you should be able to get a shade match. This is next on my to try list. For now I am loving the Luminessence from Giorgio Armani. Spf 35. I love it so much I wanna recommend it to everyone. Lol. My skin just glows when I use it. U need to try it!! Funny to me it smelled like lemon, or that citrusy smell a lot of snail based products have. Was so happy to see this write up! 😀 I’ve been hearing so much about this cc cream and wondered if it’s really up to hype. It looks great on you – but I agree on the price, that’s stopping me. I’m with you Neri! A light hand and build it up is the way to go. I usually get my coverage with concealer where I need it and a bit of loose powder usually does the trick too. Better than piling on thick layers of base eh? Looks good on you :-). Do you apply this CC cream using your 5-step technique for foundation? Used my friend’s cc cream illuminating in Tan. I am so used to very sheer coverage – my go to is NARS Pure Radiant Tinted Moisturiser and Becca Aqua Luminous that i felt that the IT cosmetic cc cream looked ‘heavier’ on my face and a bit drying. I am still thinking whether to purchase the cc cream or repurchase my NARS and Becca. I am totally sold on the SPF though. great review! may i ask what shade are you in Mac? thanks ! Thanks. Unfortunately I don’t wear MAC makeup so I don’t know my shade. I believe it maybe NC10 or 15 thereabouts?